AHD 4 Piece Engineers Square Set. 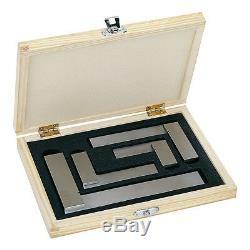 4 Piece set of general purpose high quality engineers squares with wooden case. The 4 most commonly used square sizes (2", 3", 4" and 6"). Precision blades made from high quality steel. Ideal for marking out wooden joints, checking cut stock, or checking the accuracy of your other shop squares. All surfaces and edges are ground for straightness and parallelism. Fitted wooden case for secure storage and transportation. Blade length measured from inner edge of stock to blade tip. Blade length: 2" Stock length: 1.5". Blade length: 3" Stock length: 2.5". Blade length: 4" Stock length: 3". Blade length: 6" Stock length: 4". Note: These squares are not to any standard - for workshop applications only. The item "Engineers 4 Piece Set 2 3 4 6 Precision Engineering Squares" is in sale since Thursday, November 24, 2011. This item is in the category "Business, Office & Industrial\Industrial Tools\Measuring Tools\Squares". The seller is "buybrandtools" and is located in Sheffield, South Yorkshire. This item can be shipped to United States, European Union member countries, Canada, Australia.